The last two months of the year are the most popular times to travel. Everyone wants to be with their families during the holidays, and that means going long distances. Before you set out to Grandma’s house, make sure that you follow these tips to get you there safely. Making sure your vehicle gets a look over is a good idea before any road trip. Check the air pressure and tread on your tires. Any maintenance, like changing belts, refilling fluids, and changing the oil will help with vehicle efficiency and decrease chances of a breakdown. If you do have car trouble, make sure you pull off the road as far as possible to avoid getting hit or causing traffic problems. Nothing ruins a vacation like getting in a crash or getting a traffic ticket. Use care to keep everyone in your car, and on the road around you, safe. Make sure you have a phone in your car in case something goes wrong or if you need directions. It is helpful to make sure you have a charger in your car to keep it charged. If your insurance has a special app or service that allows you to get roadside assistance, make sure you have that all figured out before you hit the road. It’s important to use all the tools available when going a long distance. Whether it is blowing a tire or a problem under the hood, it’s great to know that you can get help if you need it. If you are traveling with the family in tow, make sure you know the limits. Plan frequent stops for kids who need to use the bathroom a lot. Switch drivers if you get too tired. Refill on gas when you have the chance and don’t push too far on a tank of gas. These will all lead to unexplained stops and putting your vehicle at risk on the side of a road. It’s always a good idea to follow the old Boy Scout adage to “be prepared” and keep anything necessary in the car, or up front with a responsible adult. Many people feel more comfortable keeping a credit card or some cash in the glove box. Planning for the worst will always pay off in an emergency. While no one wants to stress the whole vacation, it is good to plan for these situations beforehand. 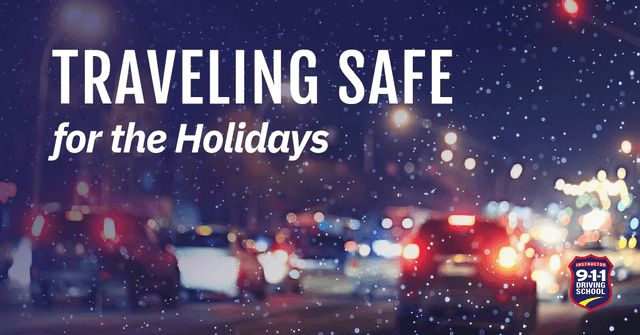 Once you cover all the basics of making sure you are traveling safely, you can enjoy your holidays.